Where Have all the Big Reds Gone? It could have been any time of the year in deep south Texas, but it happened to be a Sunday morning in late December. The wind had died, the early morning clouds were burning off, and the temperature was rising into the low 70s. On an impulse, Kathy and I grabbed our fly rods and gear and headed for our dock on the Arroyo Colorado. But before we could slip out the back door, the phone rang and it was Skipper: "Hey Scotty, the big trout are as thick as fleas east of Three Islands." Thanking him, we slid the Curlew off the ramp and headed for the Lower Laguna Madre, five miles to the east. Anchoring in 15 inches of water, we donned our lightweight waders, tied on red and white Deceivers, and slipped into the crystal clear 65-degree water. Spreading out, we began our search for large spotted seatrout, and a school of spawning-size reds that were also rumored to be in the area. Casting only to visible fish, Kathy hooked and lost a trout that would have been a new women's IGFA world record, and caught a pair of 27-inch reds out of a huge school that literally encircled her. Feeling a bit left out, I finally landed a 24-inch trout, and then caught a red that was about the same size. It was a great day for catching fish, but we both later that the sheer beauty of the crystalline water against the cloudless sky would have been enough. In the distance, the glassy, unbroken surface of the bay mirrored the sky with faithful precision. Only the occasional mullet jumping broke the illusion that heaven and earth were one and the same. The Lower Laguna is the largest continuous shallow-water estuary in North America. It encompasses over three hundred square miles of clear water ranging from less than a foot to three feet in depth, and is the only true subtropical fishery in the U.S. outside of Florida. Regarded as the least pressured, most available saltwater fly fishery in the U.S, it has also been hailed as the "best there is" when certain factors converge, most notably sunny weather, casting skill, and the ability to see fish. I grew up 45 miles inland, but spent many of the weekends of my childhood at my dad's fishing cottage on the Arroyo Colorado, a river-like tributary that enters the Lower Laguna near its north-south midpoint. My father's plywood V-bottom boat could only travel in the channels created by dredging, which limited our range of exploration considerably. Back then, we would head to the mouth of the Arroyo, and find a place to anchor along the edges of the Intracoastal Waterway (ICW) -- a manmade channel that cuts unnaturally through the Lower Laguna from north to south. There we would cast live shrimp on treble hooks back into the deeper water, and wait for the bobber -- which we properly called a "cork" regardless of its composition -- to disappear. In the ensuing years, shallow-draft skiffs opened the flats for those willing to explore them. It was then that spin fishers began to outfit their boats with towers made of PVC or aluminum so they could sight cast to visible. But fly fishers continued to overlook the obvious until the late 70s when a few locals like myself began to ask, Why not? 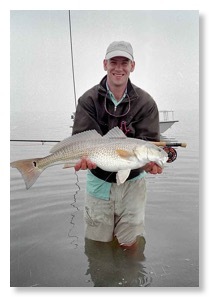 Having taught myself to fly fish on south Texas ponds when I was only 12, I finally took my fly rod down to the bay on a foggy morning in 1978, and promptly caught two redfish on deer hair flies. I realized in an instant what a treasure I had overlooked. The Lower Laguna is an unusually primitive setting. Bordered by Padre Island National Seashore on the east, and the King Ranch and Laguna Atascosa National Wildlife Refuge on the west, it remains one of the last undeveloped estuaries in the world. Nestled between the Upper Laguna Madre and the Laguna Madre de Tamaulipas of northern Mexico, the Lower Laguna is first among equals, being clearer and shalLower than its sister bays. Joined to the Upper Laguna only by the ICW, and to the open Gulf by two dredged passes, it is, in its natural state, virtually landlocked. With limited tidal exchange, and a near absence of fresh water inflow, the Lower Laguna remains clear and hypersaline even during periods of heavy runoff. areas of the country, but for some reason, on the Lower Laguna they will just about always take a well-presented fly of any reasonable description. Of course, "just about" is a pregnant phrase covering any number of occasions where redfish stop cooperating for no discernible reason. And "well presented" has to be qualified, as well. 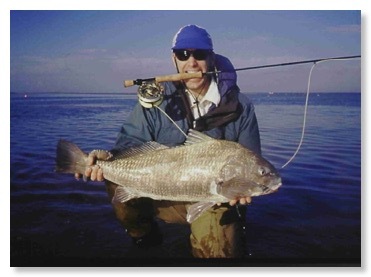 While Lower Laguna redfish will attack just about any fly that you cast to them -- as long as you don't line them -- they have excellent eyesight, and are extremely sensitive to noise. Consequently, under calm conditions, they will often spook when you come within 75 feet of them. Indeed, I have taken many clients onto the flats on calm mornings, who were able to see upwards of 100 tails around them, but never able to get within range of the the first one. Fortunately, even under these ultrasensitive conditions, redfish will usually come within range of a short cast, but only if you stop moving, Lower your profile, and wait for them -- a tall order for any angler on the edge of cardiac arrest. Because redfish often feed head-down -- either singly or in pods -- it is often hard to get their attention with subsurface flies, and they frequently spook when you cast the fly close enough for them to see it. So, we prefer using small topwaters, especially when the surface is calm and the fish can hear the popper above the wave action. I've heard a lot of people complain that they miss too many strikes by using topwaters, but by using a fly that has a wide-gap, chemically sharpened hook, and by keeping the rod tip low until the fish is definitely on, topwater flies can result in a significant increase in hookups. Speckled Trout. The other game fish that attracts fly fishers to the Lower Laguna Madre is the spotted or "speckled" seatrout. Specks live in the estuary throughout their entire life cycle, and become spawning adults when they reach 15 or 16 inches. This popular species offers both the easiest and most difficult challenge for visiting fly fishers. On one hand, "schoolie" trout -- that is, trout from 10-18 inches -- can easily be caught at night on small subsurface flies from lighted piers, or by blind casting small topwaters or Clousers along the edge of the ICW in the morning. But the larger trout are a different animal, altogether. Considered "tougher than permit" by such experts as Nick Curcione -- who fished with me this past summer -- trout above 24 inches present the kind of fly fishing challenge that appeals only to anglers like Nick, who have caught the most fish, and the biggest fish, but now want to catch the most difficult ones. 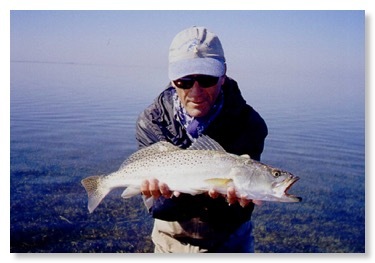 When it comes to trophy specks, the Lower Laguna offers the best fly fishing that you can find anywhere. Not only does it have the largest population of big trout on the Texas coast, but it is the only place in the world where fly fishers can regularly sight cast to tailing and cruising trout from 24-30 inches long. Four of the current IGFA records -- not including Kathy's previous 12-lb. tippet women's record -- were taken on the Lower Laguna. It's likely that more visiting fly fishers will be targeting giant trout as they find out about the largest speckled trout ever caught on a fly rod -- a 15 lb. 6 oz. behemoth -- that was caught and released by local legend Bud Rowland on the Lower Laguna in May, 2002. It is easy to conclude that big trout are especially finicky, because they typically refuse the fly. I often hear, "They're not eating," to explain their fickle behavior. It is true that big trout feed only about two hours out of every day, and so they are rarely hungry. However, they can be provoked to take a fly even when they are not actively feeding. Not long ago, for instance, Rowland caught a trout over ten pounds on a tiny fly, and the fish had a half-swallowed 10-inch mullet in its gullet. Obviously, hunger had little to do with it, but if they'll take a fly between meals, why are they so picky? Most experienced fly fishers agree that big trout are so difficult because they see us before we can present the fly. Given this theory, the key to catching them is to see them before they see you, which is no easy feat. Big trout blend into their surroundings better than reds do, so in order to see them first, you have to go slowly, study your surroundings, and do your best to blend into the natural order. Other Species. Some fly fishers enjoy sight casting to the wily, hard-fighting sheepshead, which can be found tailing on the flats in large numbers all year round. We have developed flies that imitate the sheepshead's favorite food sources, and believe that we have begun to crack the code on a fish that most fly fishers consider a waste of time. It is not unusual to get 50 shots a day at tailing sheepshead in the 2-5 lb. range from December through February, when for some reason they seem more willing to take a fly. So if an angler can figure out what they want, he will be amply rewarded. Black drum in the two- to five-pound range visit the flats in large schools from late summer through fall. They, too, can be caught on flies, even though they are much harder to please than their look-a-like cousin, the redfish. Feeding on slow moving organisms such as tiny crabs, worms and mollusks, they are less aggressive than reds, and will not chase down fast-moving flies. Recently, a client from Delaware, Steve Puzoli, caught a new state fly rod record -- a 19 1/2 lb. fish that took a dead-drifted Deceiver, of all things. The huge fish was swimming in a foot of water near the edge of a channel, and its back was three inches above the surface. A variety of warm-water species visit the estuary from March until December. 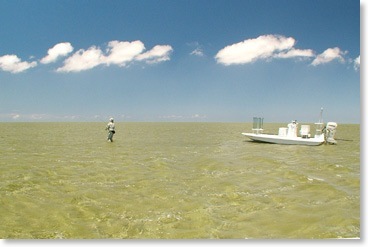 Fifteen- to 30-pound jack crevalle enter the bay in the autumn and venture onto the flats during extreme high tides. You can see them crashing bait a half mile away, and if you're lucky enough to hook one, you may be unlucky enough to lose your whole line before its over. Tarpon usually stay just outside of the estuary from March until December, and they can be caught near the jetties at the two outlets to the Gulf. However, the tarpon's next of kin, the ladyfish, spends spring through autumn feeding inside the estuary alongside redfish and trout. Known as the poor man's bonefish, the ladyfish is the highest jumping, hardest fighting fish on the Lower Laguna. But despite her virtues, the ladyfish often intercepts flies intended for redfish and trout, leaving fly fishers wishing that the ladyfish would take a hike. For instance, I recently stalked a tailing pod of about a dozen redfish. When I cast my VIP popper into the bouquet of tails, a ladyfish hit the fly the moment it touched the water. The tails promptly disappeared, and I grumbled quite audibly, but I was able to keep from hooking the spirited ladyfish by keeping my line slack. I lifted the fly out of the water and presented again, hoping the redfish were still in the area. This time, a ladyfish came completely out of the water to take the fly. Frustrated by the interference, I avoided the hookup again by letting the fish run without resisting it. Again the fly came free. This action repeated itself a third time, and by the time I had my fly back, I assumed the reds had left the area. But on my fourth cast, a 24-inch red found an opening and took the fly explosively, as though it knew it had to act quickly. From a rational point of view, unless you're interested in eating your catch, the ladyfish has no peer as a hard fighting fish. To give you some idea of what I mean, when Kathy recently caught a new state fly rod record ladyfish, the fish almost spooled her, and it only weighed 3.1 pounds. More and more fly fishers are beginning to target the Southern Flounder, a game fish that is surprisingly easy to catch on a fly -- that is, if you know where to go and what to do. Skipper Ray, a guide operating out of South Padre Island, has perfected a technique for taking flounder on the fly, by using a two-foot section of lead core trolling line on the end of his floating line, and then casting heavily-weighted Clouser-like patterns along the edge of the ICW. In this way, Skipper regularly catches a dozen or more flounder in areas where they congregate on the outgoing tide. presentation takes a while for most folks, so we urge visitors to plan on fishing for at least two days, in order to give themselves time to develop this crucial skill. Under less ideal conditions -- as during a windy and cloudy day -- we go in search of gulls hovering and diving over pods of tailing reds and trout feeding on shrimp. This often occurs at the end of the day, giving our clients a chance to experience a relatively easy way to catch a redfish after having faced more daunting challenges. This scrappy action can save us from our last resort -- casting blindly in areas where fish are known to congregate. While I have little interest in blind casting on a body of water so large that each fish can easily have an acre of water all to himself, it can provide some fast action for small trout and flounder that gather along the ICW's edge. the white sand. 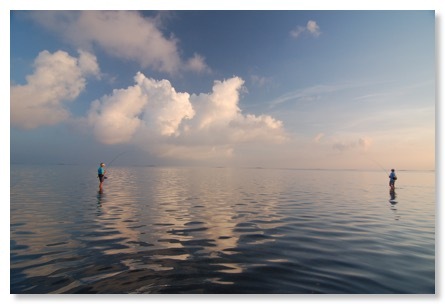 This area resembles a classic bonefish flat, and the action is similar. Whether fishing from a poled skiff, or wading on the rock-hard bottom, the fly fisher can spot approaching fish from 75 yards away, and spend the next several minutes getting into position for a long and precise cast. While the beauty of the white sand can move fly fishers to tears, the challenge can bring them to their knees as they discover that the game fish can see them coming from 75 yards away, too. Not surprisingly, most anglers concentrate on other areas, leaving the white sand for those who prefer the greatest challenges. It's hard to imagine a place that offers more beauty and diversity of challenge for fly fishers than the Lower Laguna Madre. 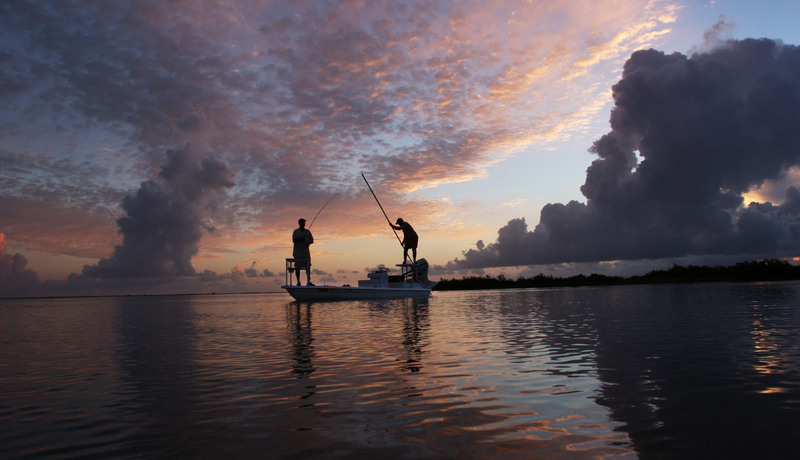 But since I lived on the east coast for much of my adult life, and split my fly fishing time between the mountains of Virginia and the Lower Laguna Madre, I really don't know from personal experience how the Lower Laguna stacks up to other salt water fly fisheries. But I get a sense that it compares favorably. When Nick Curcione was visiting recently, I expressed an interest in fly fishing other places, and doing some of the things that he has done. He surprised me by saying, "I don't know why, because if I lived here, I'm not sure I'd ever want to leave." I still would like to cast to tarpon in Belize and bones in the Bahamas, and stalk giant Trevally on Christmas Island. But if I don't make it to all of these place, it's good to know that the Lower Laguna Madre is about as good as it gets. The best shallow water skiffs in the world. The rods and reels we use and sell.